It was supposed to be an experiment that will change the world. It ended up changing him. This is a story of the Hulk (Bruce Morphs), a scientist whose experiment on gamma rays went wrong. The Hulk is a Marvel character that features a man who turns to a huge green monster every time he gets angry. The Incredible Hulk is one of the several characters developed by Marvel. The game developer, Playtech, was given the rights to the developer a slot themed on this popular comic. Playtech is the second biggest game developer in the world, and it is famous for the Marvel series of slots. The comic first hit the shelves in the 60s followed by the TV series and finally the award winning film. There are three versions of the Incredible Hulk; a 25-line and a 50-line version of the slot and a more old school Cryptologic Incredible Hulk slot. The Cryptologic version is however a low graphics version that can’t compare with the two other Playtech versions. The 50-line and the 25-line version games are the same in appearance and perhaps the only difference is the maximum bet. There’s one thing that never disappoints about Playtech games; graphics and sound. The graphics on this game is mad! The very first thing you will notice about the game is the 3D graphics that will get your blood racing. The imagery used in this game is of high quality, and it will amaze any fan of the Incredible Hulk. The theme is of course green with police cars, choppers and the traditional King, Queen, Jack, Ace and 10. The sounds are also themed and will change periodically as you play. Before you send your heart to an overdrive, wait till you learn the bet sizes. You can get coins from $0.01 to $5 with a max bet/line of 10 coins. The maximum bet size is $500 and $250 for the 50 line and the 25 lines respectively. Guess which symbol runs wild? The Hulk himself! The hulk only appears in 2, 3 and 4 reels. If you land the Hulk on the middle reel, he runs wild giving you two free spins. If he appears on all three reels, all the three symbols expand and real 5 and 1 will start spinning backwards. If you land three Incredible Hulk logos (not the angry man himself) in any position, you activate the Scatter pay zone. You get to enjoy ten free spins with 3x multipliers. During the free spins, the Hulk himself can earn you triple payouts. 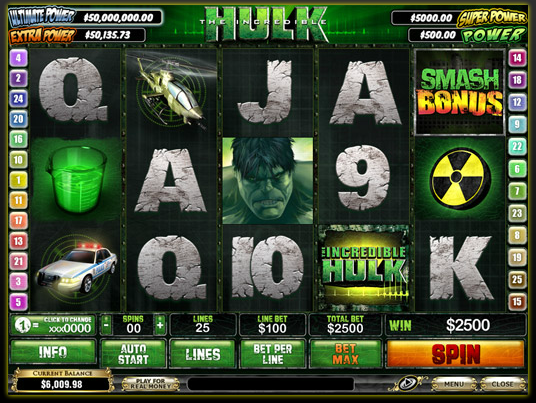 You can even re-trigger the free spins if you land three or more Hulk Logos- this means huge bonuses. The good times are not over, when you land five radioactive hazard symbols; you get a massive 12,000 coins. Do you fancy Bonuses? When you land the bonus symbols on reels 1 and 5 at the same time, you activate the bonus round. This is your chance to tame the massive beast. You’ll have to demolish at least three of the seven police cars in order to get a cash bonus. If you pulverize any one of the three helicopters, you get a multiplier (now this will make you rich). For instance, if the random rage feature is activated during the bonus game, The Hulk gets mad and ultimately destroys all the seven police cars giving you massive rewards.